Just two weeks ago I could see through this clearing that is now covered with leaves. You normally would be able to see a house up on the hill. I now know this house to be the large remodeled home that sits above Crusade Castle. Putting it all in place. I took the opportunity to document the three information posts at the overlook. 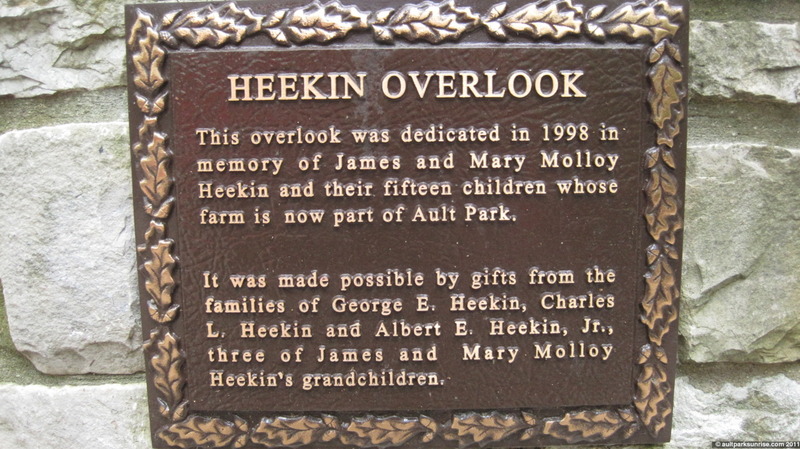 The first one describes the dedication of the Heekin Overlook in 1998. The other two are descriptions of the scenic valley. 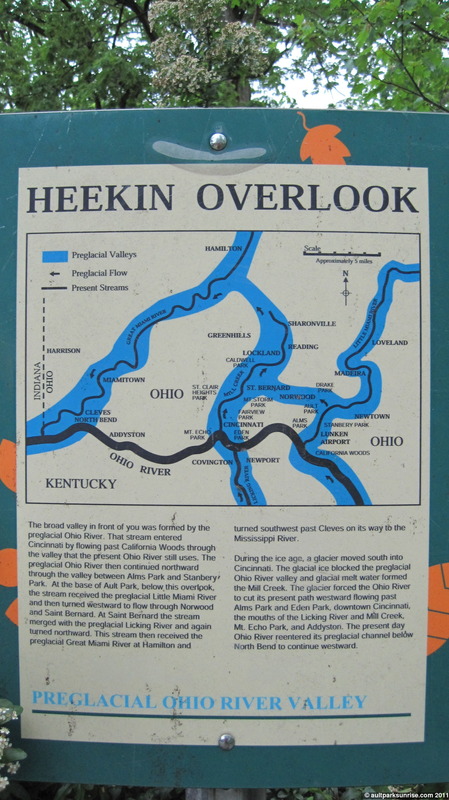 A bit of background information to the Heekin Overlook. This plaque can be seen in the “overlook timelapse pictures” at the base of one of the center left stone column. This is my favorite post because it describes the pre-glacial Ohio River path that differs from the path it takes today. This explains why the Little Miami River valley that the overlook peers down into is so wide and fertile. Explaining the geography of the valley. It reads “The broad valley in front of you was formed by the preglacial Ohio River. That stream entered Cincinnati by flowing past California Woods through the valley that the present Ohio River still uses. 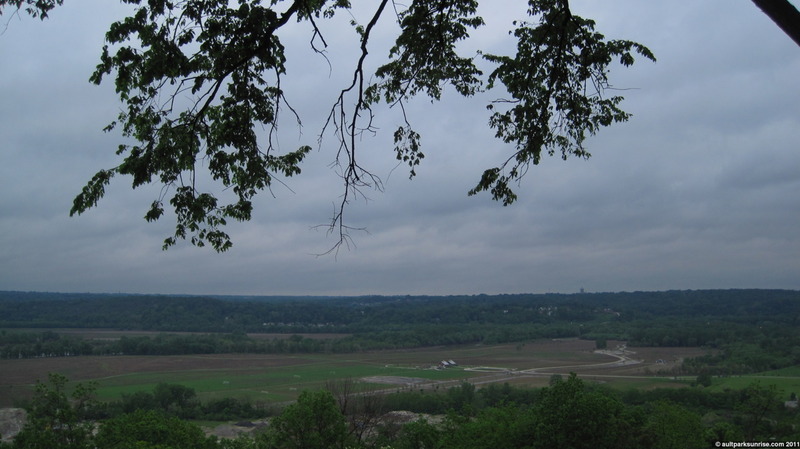 The preglacial Ohio River then continued northward through the valley between Alms Park and Stanbery Park. 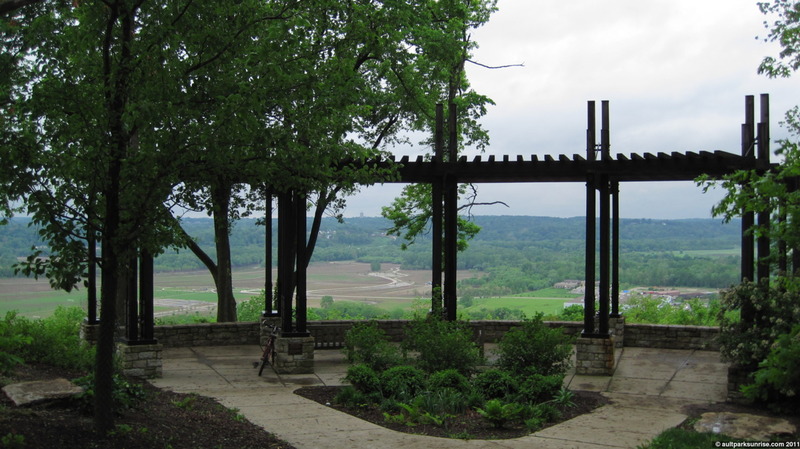 At the base of Ault Park, below this overlook, the stream received the preglacial Little Miami River and then turned westward to flow through Norwood and Saint Bernard. At Saint Bernard the stream merged with the preglacial Licking River and again turned northward. This stream then received the preglacial Great Miami River at Hamilton and turned southwest past Cleves on its way to the Mississippi River. During the ice age, a glacier moved south into Cincinnati. 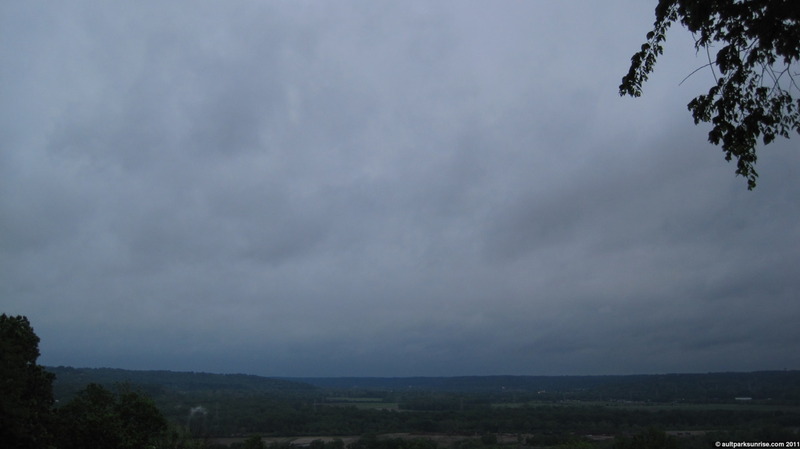 The glacial ice blocked the preglacial Ohio River valley and glacial melt water formed the Mill Creek. 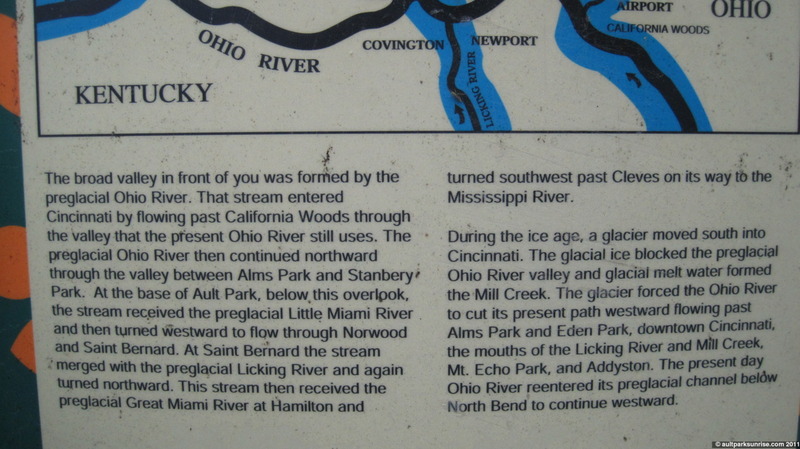 The glacier forced the Ohio River to cut its current path westward flowing past Alms Park and Eden Park, downtown Cincinnati, the mouths of the Licking River and Mill Creek, Mt. Echo Park, and Addyston. 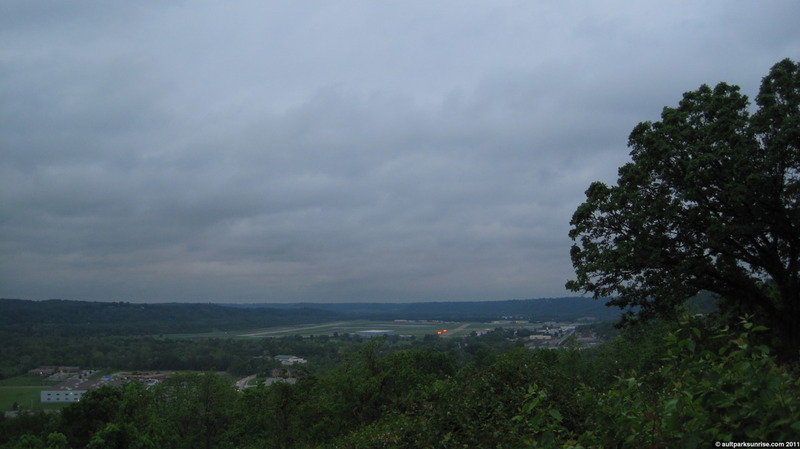 The present day Ohio River reentered its preglacial channel below North Bend to continue westward. 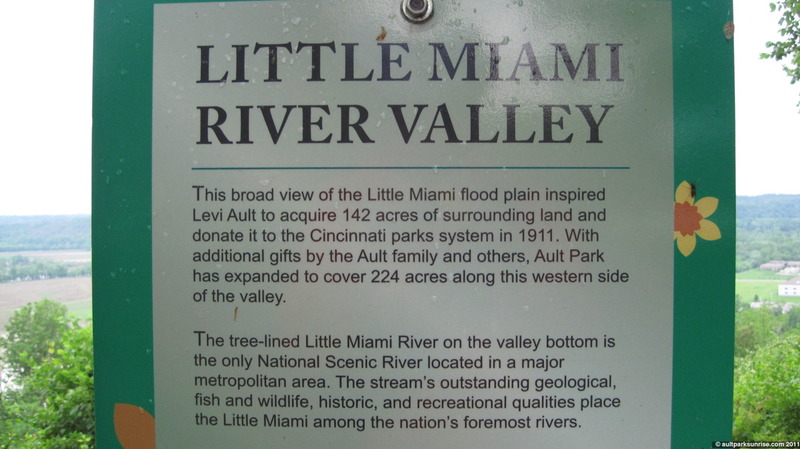 The Plaque Reads: “Little Miami River Valley — This broad view of the Little Miami flood plain inspired Levi Ault to acquire 142 acres of surrounding land and donate it to the Cincinnati parks system in 1911. 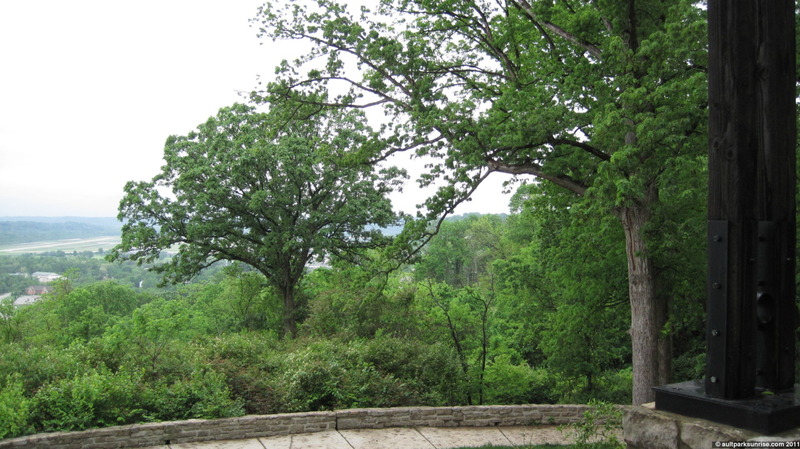 With additional gifts by the Ault family and others, Ault Park has expanded to cover 224 acres along this western side of the valley. The tree-lined Little Miami River on the valley bottom is the only National Scenic River located in a major metropolitan area. The stream’s outstanding geological fish and wildlife, historic, and recreational qualities place the Little Miami among the nation’s foremost rivers. This entry was posted on May 16, 2011 by Ault Park Sunrise. 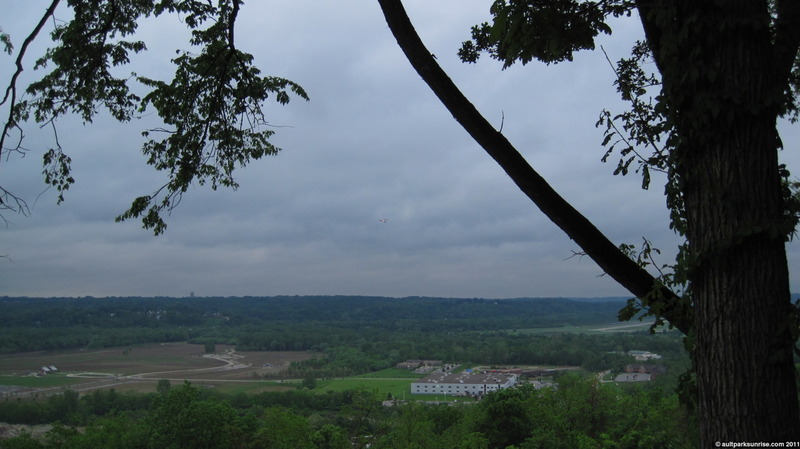 It was filed under ault park, overcast, sunrise and was tagged with armleder park, ault park, cincinnati, little miami river, lunken, ohio river, parks.